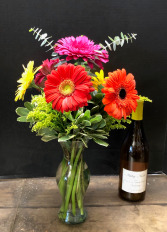 When asked to send a flower arrangement “just like the one you sent for us six months ago,” we respond that our arrangements are like fingerprints; no two are the same. There are so many ways to do flowers, just like the many flavors of ice cream. 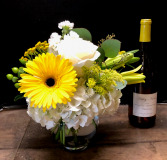 Floral designers perform best when given license to create without micro-management. 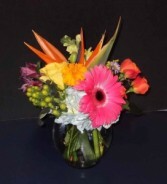 The worst approach, unfortunately the tack taken by the FTD/Teleflora crowd, is to come up with pictures of “ideal” arrangements and say, “Here, copy this!” Around the shop we call this “paint by numbers.” Designers hate these orders. They can do them, but they produce the worst outcomes. 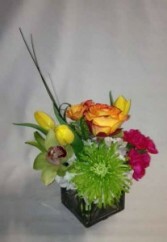 It is far better to put qualifiers on your arrangement and allow the designer to create within these parameters. 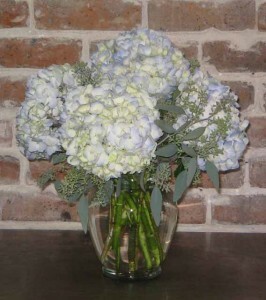 Making flower choices to the following give a good formula the designer can follow. 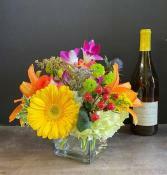 Vase or cello wrapped arrangements; Color, either bright, strong colors, or soft pastels, perhaps monochromatic; a mixture of garden flowers, tropical flowers, or all one type of flower; an arrangement with a contemporary feel, or more traditional. 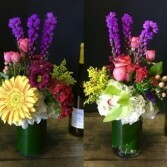 Write your flower formula using these choices and we believe you will be happy with the designer’s creation. Not to contradict what we have just said, but so that you may better understand these options, we include examples of our work for browsing here on the web. Just keep in mind that our presentation will be “in the spirit of” a certain arrangement. 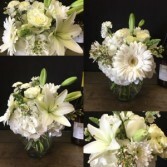 Our fresh flower stock changes day to day, and it is often impossible to replicate a certain flower arrangement viewed here. Sometimes you don't need a reason to remind someone you care. That's why we think "Just because" is one of the best reasons to say: "Thank you" "I'm sorry" "I love you" "Hope you're having a good day" "Hope you're having a better day" "Good luck" "Congratulations" "I miss you" "I wish I could be there" or "Forgive me." 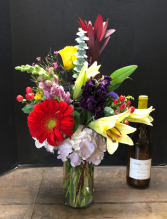 Browse our sample selection at HARKINS THE FLORIST in New Orleans, LA and order online or call us 504-529-1638 to place an order "Just because." 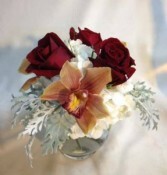 This darling design combines roses with cymbidium or phael. 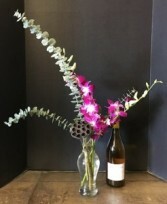 orchid blossoms, and is finished with lacey, silvery Dusty Miller. One of our long and low centerpieces. This is styled in an oval shape for a larger rectangular table, but the arrangement can be altered for a round table top. 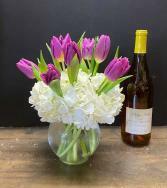 We will be more than happy to create this style in colors to complement your décor. 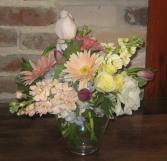 A beautiful cylinder of bright gerber daisies, delphinium, roses and lilies, we've added hypericum berries and aster. The wine bottle is shown for scale.